Coastal communities face complex and urgent challenges. They see higher levels of deprivation, underemployment and educational underachievement when compared to communities inland; and they are more vulnerable to the impacts of climate change and the declining health of UK seas. At the same time, there’s great appetite on the coast for change, and for a new approach to economic development that gives people real control over their lives. Solutions to reinvigorate coastal economies are beginning to emerge, but there are barriers to delivering alternative local visions. Community-led projects struggle to compete with larger investment plans, because there remains a focus by national and local authorities, on delivering economic growth, too often at the expense of social and environmental benefits. The coast also hosts some of the most deprived areas in the country, meaning that people lack the tools and power they need to drive and deliver change. If we want coastal communities to be in control of their future, we need to invest in building the capabilities of the places, people and communities there. Local Trust is an organisation set up in 2012 to deliver Big Local, a unique programme that puts residents in 150 communities across the country in control of decisions about their own lives and neighbourhoods. Funded by the largest ever single commitment of lottery funds – a £217 million endowment from the Big Lottery Fund – it provides over £1 million of long-term funding to each area over 10-15 years. 26 of the Big Local groups are part of the coastal economy, including the Northfleet North group that covers an area on the coastal waters of the River Thames. The group has been supporting an initiative to restore Northfleet Harbour and bring it into community ownership. Northfleet Harbour is a huge facility with a long history and great value to the community, but has been forgotten and left in great need of repair. The Northfleet Harbour Restoration Trust was set up to transform the harbour. The community want it to be more than just a marina; they want an asset for sea scouts, fishers, and the protection of coastal and marine heritage. The community wants the Harbour and its surrounding area to become a hub for different community activities, and to support the development of local industries like fisheries, tourism and historic ship restoration. Big Local has helped them fund a feasibility study and access expert advice to put together a plan to secure the support and investment they need to make their vision a reality. Through our Blue New Deal initiative, we have met coastal communities who want to take control of important coastal and marine assets, and ensure that they are developed to benefit their area. The Portpatrick Harbour Community Benefit Society, for example, was successful at bringing their local harbour into community ownership in 2015. This has given the community the opportunity to make decisions on the sustainable development of their seafront. Coastal communities alone cannot solve the complex challenges that affect them. They can’t on their own build cross-country railways or raise the level of money needed to restore the UK’s precious coastal habitats. But they have already got many of the solutions to tackle issues at a local level and build greater economic resilience and wellbeing. There needs to be greater opportunities for coastal communities to come together to share experiences and scale up solutions to the urgent challenges they face. That is what the new partnership between NEF and Local Trust wants to achieve. We will work with residents from up to 12 Big Local areas on the English coastline to hone community leadership skills and develop expertise in resident-led economic revival. 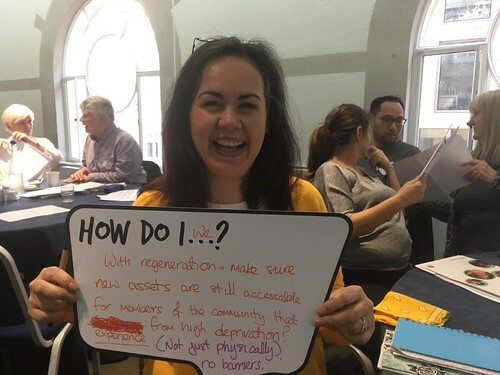 Through the course of the learning programme each community will develop a bespoke plan to boost the local economy, and a parallel research project will gather findings to share with other Big Local areas and coastal communities. There is so much knowledge that coastal groups can share to inspire each other. By bringing them together, we are creating the potential for shared knowledge and long-lasting relationships. With groups sharing solutions to their challenges, local successes can begin to add up to a transformation on the UK coast.